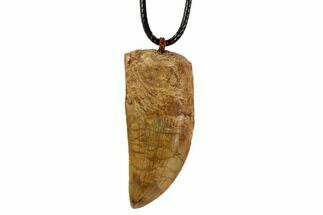 Nothing can be quite as menacing as the deadly grin of a Tyrannosaurus. 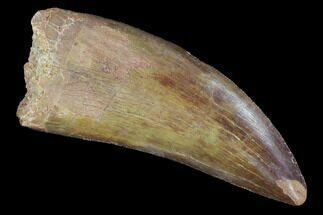 Though scary, those massive teeth served a very integral purpose to the life of the dinosaur. 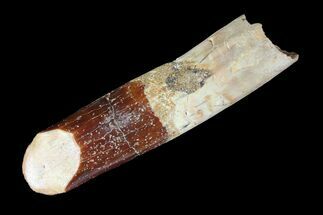 By looking at the size, shape, curvature, wear, and numerous other details of teeth, scientists can discern not just what the dinosaur ate, but also intricacies on how it ate, and how it fit in with the other animals and plants in its ecosystem. 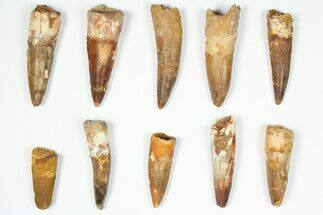 Most dinosaurs replace their teeth very rapidly, with some adults going through thousands of teeth in their lifetimes. 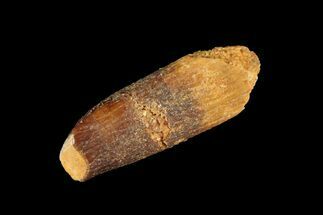 This process is continuous and as the crowns are shed other teeth take their place and the root of the tooth is absorbed. 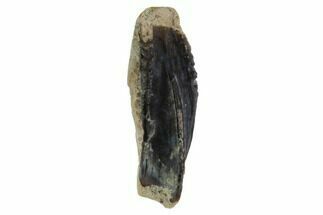 Because of this dissociated dinosaur teeth without crowns are quite common in the fossil record. 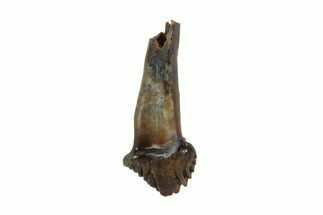 Rooted teeth are much rarer, the root of a tooth is quite fragile and the tooth would have to come from an animal’s skull after death has already occurred. 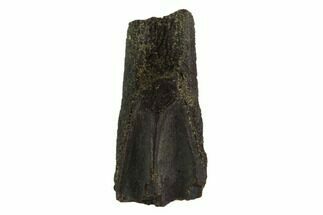 Unerupted teeth are occasionally found as well. 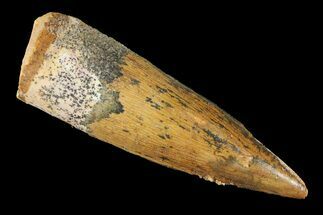 These teeth never passed through the gum tissues while the animal was alive so they show no feeding wear. 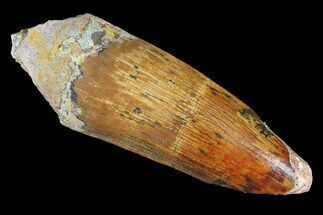 A rooted Spinosaurus tooth. 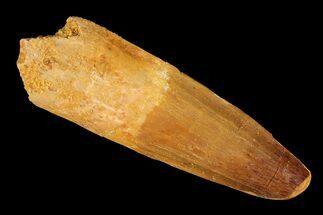 The actual crown of the tooth which would be exposed in the mouth is only about 1/3 of the length. 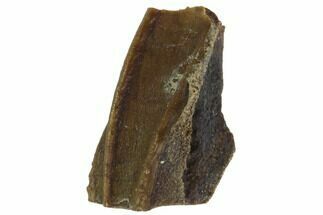 Very few dinosaur teeth are found with their roots still attached. 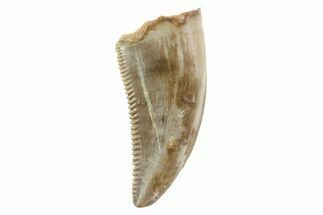 Typically teeth are not found in pristine condition and will show wear from feeding. 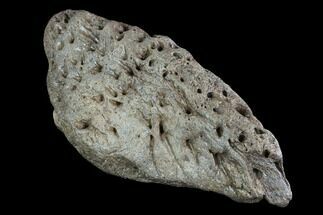 This wear can give clues as to specifically what the creature ate and how the jaw moved when it was feeding. 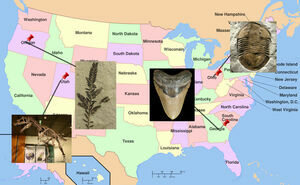 Each dinosaur species fits into specific dietary niches within their ecosystems. One animal may graze on coarser plants close to the ground while another eats softer vegetation higher up and their teeth will vary based on the differences in their diets. 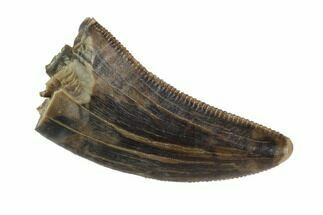 Triceratops teeth showing varying degrees of wear. Left: Unworn with root. 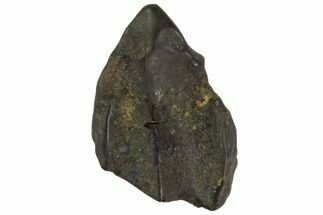 Center: Moderate wear. 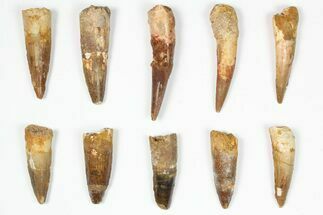 Right: Heavily worn "shed tooth"
Because of the specificity of dinosaur diets many species typically have only a single type of tooth in their jaws with variations only in size. 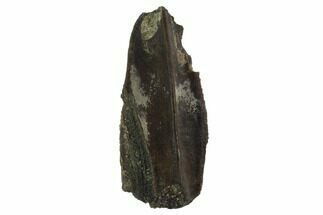 The big exception to this is most meat-eating dinosaurs, who’s teeth sometimes varied significantly in size and shape as one moves back in the jaw. 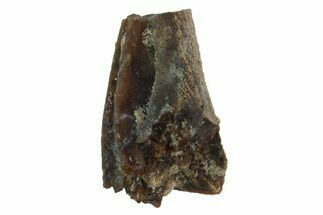 The front teeth (premaxilla teeth) were typically much more conical in shape and closely packed making them ideal for gripping and pulling. 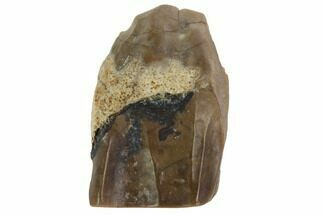 The teeth further back in the jaw frequently were more blade like to aid in cutting and slicing of meat. 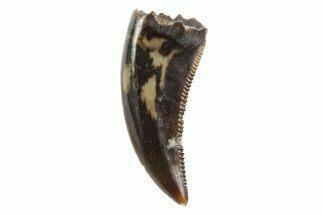 This variation in tooth shape sometimes makes it very difficult to assign isolated teeth to a particular dinosaur species. 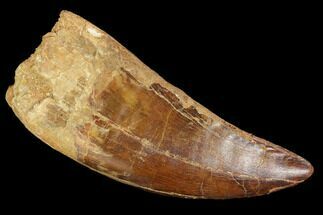 Tyrannosaurus rex is the reigning king of tooth size with the longest recorded tooth being 12” long. 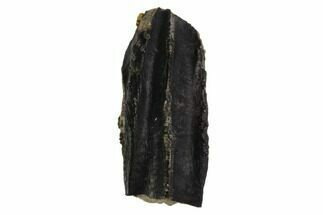 This measurement includes the root of the tooth with the exposed portion being around 6”. 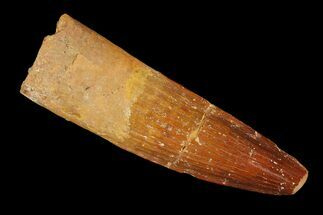 The tiniest teeth likely belong to the needle-like teeth of the paravian dinosaurs like Microraptor. 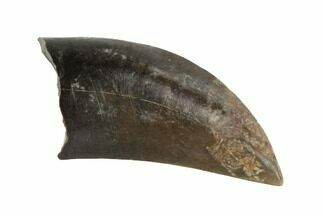 Many theropods lose teeth while digging into their meals and they’ve occasionally been found embedded in the fossilized remains of their prey. 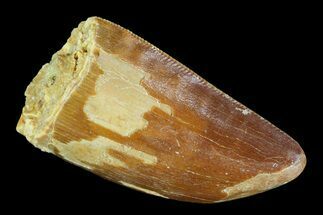 Many times fossil teeth are all that are known of a species. 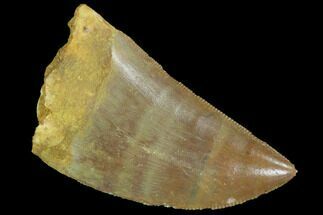 This is the case with the elusive Moroccan “raptor”, known only from plentiful teeth found in the desert, yet no skeletal remains have been discovered. 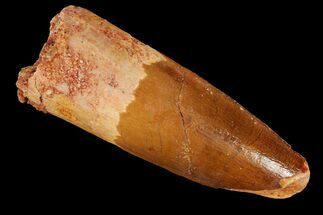 Isolated teeth like these can give hints as to how many different species lived in an area, however fossilization favors ecosystems where water is present and finding only teeth from an animal may be deceiving. 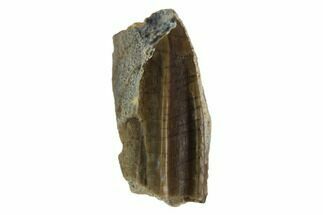 Teeth are often small and can tumble downstream in a current much like any stone or pebble. 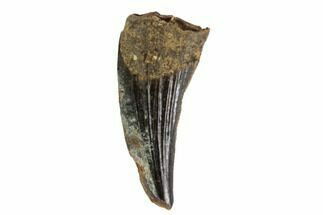 It’s unlikely that skeletal remains will be found from mountain dwelling dinosaurs, but their teeth could flow down the mountain to be deposited in the floodplains far below to mingle with teeth and skeletal remains of dinosaurs that lived in that river environment. 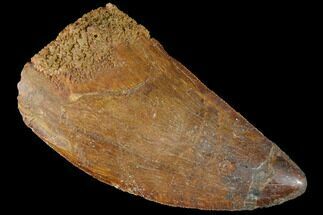 This is an extreme example, but it points out how assuming the mountain dinosaur lived on the floodplains based only on tooth remains can be problematic. 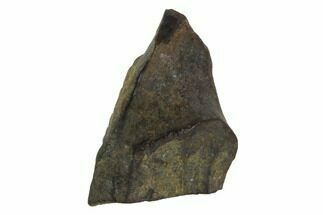 Carinae - The ridges that typically form the sharp edges of therapod teeth. 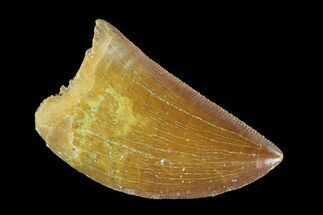 Denticles - The serrations that form on the carinae. 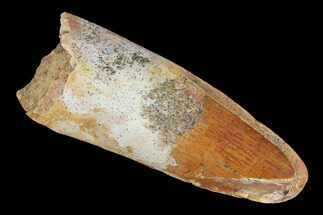 Root - Part of the tooth embedded in the jaw. 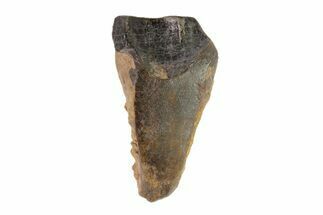 Crown - Part of the tooth above the jaw and typically covered with enamel. 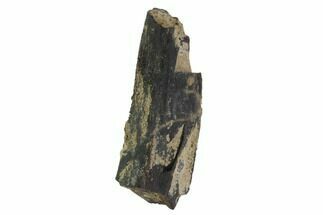 Enamel - Hard and shiny outer surface of teeth. 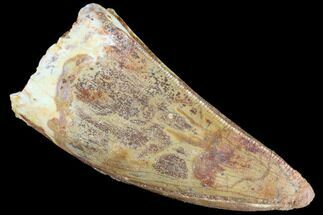 Maxilla - Bones forming the upper jaw that typically contain teeth. 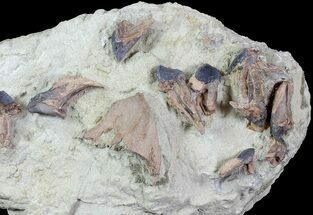 Pre-Maxilla - The bones at the front of the snout that often bear teeth. 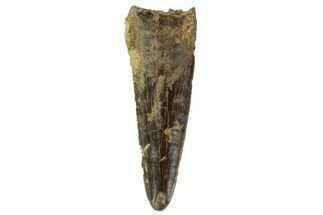 Dentary - Bones forming the lower jaw that typically contain teeth. 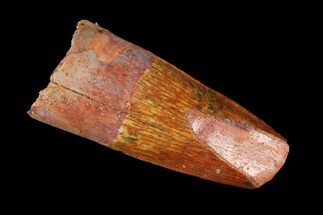 Pre-Dentary - The bones at the front of the lower jaw. Not often present. 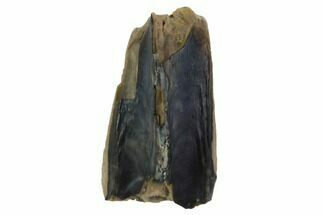 A large T-Rex tooth from South Dakota. 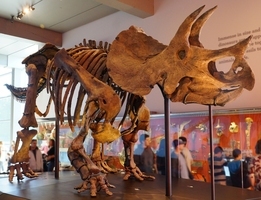 Profile view of a skull (AMNH 5027). 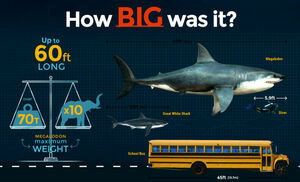 The largest known Tyrannosaurus rex. 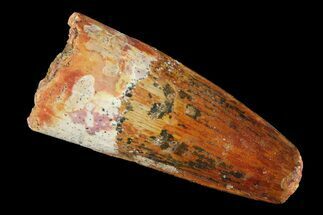 The long spear like teeth of Spinosaurus are well adapted for catching and holding onto fish. 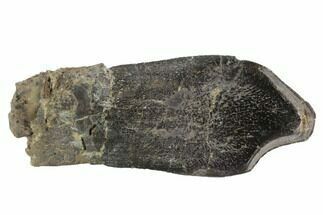 A reconstructed Spinosaurus skull showing tooth placement. 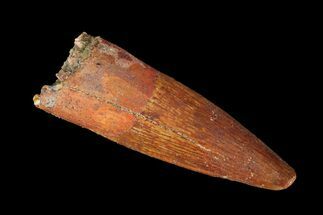 A rooted Triceratops tooth, approximately 2 inches long. 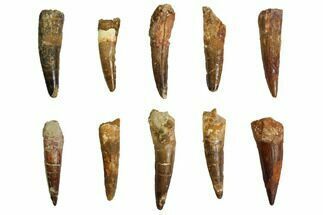 Teeth of the giant sauropod dinosaur Diplodocus resembled small pegs that were around an inch long in adults. 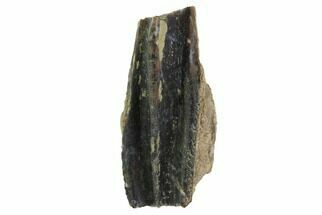 The spoon shaped teeth of Camarasaurus would have worked well for eating course plant material. 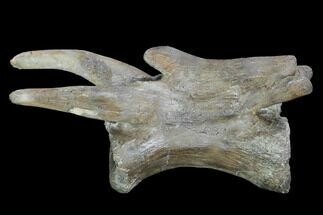 A Camarasaurus skull showing tooth placement. 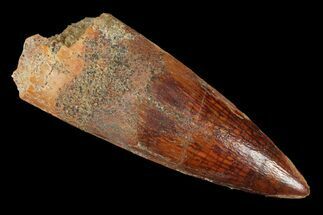 A large Allosaurus tooth from Morrison Formation of Colorado. 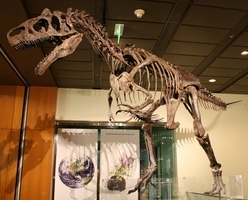 A reconstructed Allosaurus skull showing tooth placement. 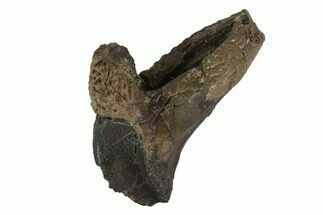 Rows of small teeth in the jaw of Edmontosaurus, ideal for chewing vegetation. 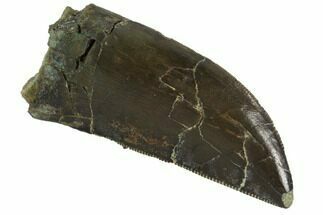 The highly serrated, steak knife like teeth of Carcharodontosaurus are designed for slice flesh. The tooth of an undescribed raptor from the Kem Kem Beds of Morocco. 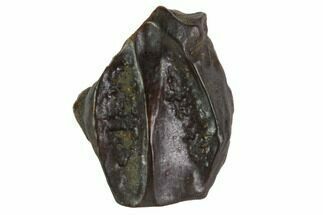 A leaf shaped tooth of Ankylosaurus, less that 1/2" long . 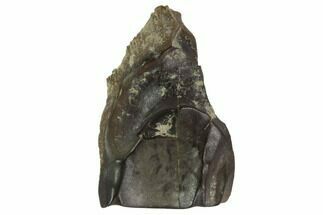 Stegosaurus was a herbivorous dinosaur with around 78 small, triangular and flat teeth that it use to consume a likely diet of plants such as mosses, ferns, horsetails, cycads, and conifers or fruits. 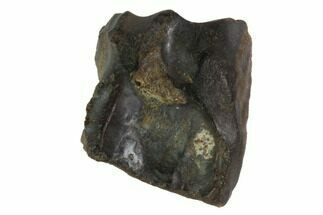 The wear that occurs on their teeth show that stegosaurus could grind its food, however the specific way in which it did process its food is still under study. 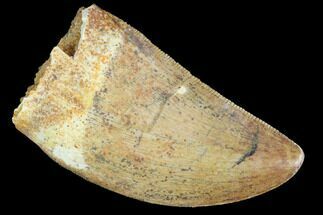 Stegosaurus teeth were not pressed together like most herbivores and therefore did not make an efficient grinding surface and it appeared that it could only move its jaw in an up and down motion and had no side to side movement like a cow.